Edison's statement indicated his pleasure upon opening the Pearl Street station. But even he would have had difficulty predicting the consequences of his invention. It stimulated a lighting industry that quickly spread through cities and towns across the country. And it helped establish a need for large central stations, beginning with Niagara Falls. Ironically, since these stations would rely on alternating current for efficient long-distance transmission, they would lead to the abandonment of Edison's direct current systems in most applications. Over the course of the next half century two especially significant social effects became clear. We gained control over light in homes and offices, independent of the time of day. And the electric light brought networks of wires into homes and offices, making it relatively easy to add appliances and other machines. As reflected by FDR's statement, low cost lighting and nationwide electrification became fundamental parts of twentieth century America. At first, most of the current from the Niagara generators was used locally. The production of aluminum (such as the ingot and trays shown here), and Edward Acheson's newly discovered abrasive "Carborundum" both required tremendous amounts of electricity. But some was transmitted to Buffalo, where it was used for lighting and for street cars. Here was practical proof that long-distance systems were indeed efficient. In succeeding years, the construction of an interconnected system of large, central generating stations, high-voltage AC transmission lines, and lower voltage AC and DC distribution lines in cities and towns across the country resulted in the creation of a national grid. This was an integrated energy system that could make electricity and deliver it hundreds of miles to wherever it was wanted. The electric lamp gave people complete control over lighting inside their homes and work places at the click of a switch. By the eve of World War II this was largely true, with the help of the Rural Electrification Administration (REA), even in rural areas. As more people turned to electricity for light, prices of both lamps and electricity fell. Older forms of lighting, such as candles and oil lamps, became used only for special occasions or emergencies like power "black-outs." The consequence was to interrupt the normal, biological rhythms of life and to alter our schedules for work and leisure. Industrial plants could operate in shifts around-the-clock, for example, and the concept of "the city that never sleeps" became a reality. Use of the new technology effected building architecture as daylight became only a supplemental source of light. Electricity for lights, elevators, and pumps allowed architects to design "skyscrapers" of unprecedented height. The "windowless building" was also an architectural design option by the 1930s. The availability of more powerful light bulbs made controlling the light they emitted a necessity. Fixture makers combined both art and science in electrical luminaires that provided optical control and fashionable design. A Danish immigrant, Frode Rambusch, started a business in New York in the 1890s designing murals and stained glass windows for public buildings. He soon expanded activities to make special lighting fixtures, incorporating artificial light into the architecture. 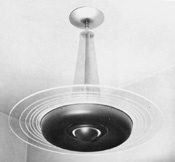 Above is a Rambusch fixture designed in 1939 for church illumination. Decorative and novelty lights quickly found acceptance. Edison made small lapel lights which he gave to friends. The first Christmas tree known to use electric lights was trimmed in the home of Edison Company vice president Edward Johnson in 1882. Conrad Hubert and Joshua Cohen (founders of Eveready Battery and Lionel Trains, respectively) also produced miniature decorative lamps, but then put the lamps to practical use in 1898 with the hand-held flashlight. The economic effect of electric lighting went far beyond increasing the workday. Profits generated by the electric lamp, in effect, paid for a network of generators and wires. This infrastructure then became available for a whole new class of inventions: appliances and equipment that by the 1930s had transformed the home and the workplace. A major factor slowed the adoption of electric lightthe need to install electric wiring. 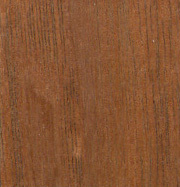 Nineteenth century construction materials and techniques often made this a very difficult and expensive process. The ability to use electricity for non-lighting tasks gradually became an important incentive for home and factory owners to make the investment. Manufacturers developed a wide range of electric appliances for the home. Electric irons and washing machines made laundry day less labor intensive, while electric vacuums made cleaning carpets and furniture easier. Time spent doing domestic tasks didn't seem to decline, however, as standards of cleanliness rose and fewer families employed domestic servants. Electric refrigerators presaged an end to ice boxes and home ice deliveries. 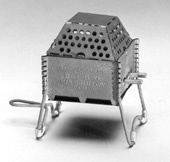 Bread toasters, tea kettles, waffle irons, and marshmallow toasters (above) were only a few of the electric appliances introduced to kitchens. Many of these smaller devices sported elaborate and artistic designs, and were meant to be used at the dinning room table. Electric climate control began with fans and radiant heaters that used special light bulbs. Personal care items like electric hair dryers, heating pads, and shaving mugs appeared. Electricity for telephones and radios brought users instantaneous personal communications and news and entertainment. Indeed, radios and lamps were the two electrical devices that sold steadily throughout the Great Depression. Small electric motors freed factories from the need to arrange equipment based on power shafts and belts. Each machine, independently powered, could be arranged on the shop floor for efficient production flow. Electrified tools boosted industrial productivity, and many were eventually made available to domestic "do-it-yourselfers." Electric power for transportation made subways practical and streetcars more efficient. These in turn provided central stations with daytime consumers of electricity. Electric cars and buses never overcame competition from the internal combustion engine, however, despite the best efforts of Edison, Samuel Insull, and others.